It seems Sierra may well be on her way to a full album. Our daughter has turned into a prolific artist, churning out yet another soon-to-be hit, “Tour de France,” clearly inspired in much the same way Queen‘s Freddy Mercury was inspired to write “Bicycle Race.” Considering it was released during Bernard Hinault‘s reign of the Tour, I’m not surprised the race served as a muse for Freddie and the crew. They churned this beautiful hit along with a bunch of other classic tracks on their album Jazz which included every genre but its namesake. Freddie, however, wasn’t the only muscian inspired by bicycles. A notable example is Pink Floyd‘s “Bike” from the equally eclectic, but also experimental and entirely epic Piper at the Gates of Dawn album. Because it was released just before Eddy Merckx dominated the Tour, it lacks the passion of Queen’s song, but it makes up for it with charming British humor and extreme psychadelia in a way only Syd Barrett could do. 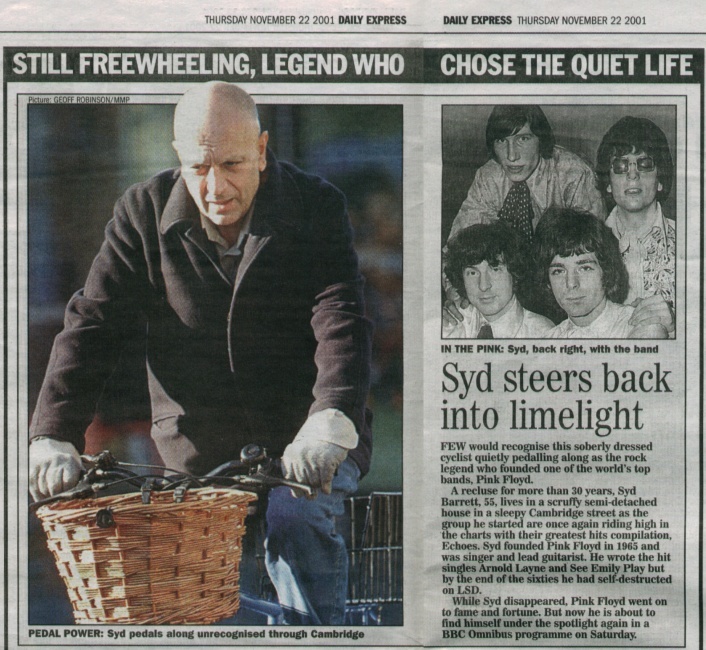 Interestingly Syd was found riding his bike nearly 35 years after the release of the song, but shortly before he sadly went the way of Freddie and passed away. Happily, though, all of the bike inspired musicians haven’t died. German electronic music pioneers Kraftwerk had to postpone the release of their Tour de France Soundtracks for a decade or two thanks to cycling, but they’re still alive. These same people who brought us “Trans-Europe Express,” “Radioactivity,” “Pocket Calculator,” and other indicators of a technologically advanced modern era, were into archaic technology: the bicycle. In fact, they were obsessed with them. They had their own cycling club. What eventually led to the shelving of their plan to release a whole bike-inspired album was a rather traumatic crash from leader Ralf Hütter. Luckily he’s recovered and with him has recovered one of the greatest musicians in electronic music ever. Lynette even secured proof in Seattle, 2004. There are many more intersections of bicycles and music, though. Click those iTunes links above, enjoy some of the highlights, and can we get those singing lessons so Sierra added to the list! that might be good but this is better! originally uploaded by Mark Jensen. 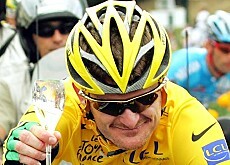 Our good old American contender to win the Tour de France, Floyd Landis, was doing pretty good until the latter part of Wednesday’s Stage 16. He simply cracked. You could tell up the final climb he had no fight left in him. People dropped long ago were passing him. 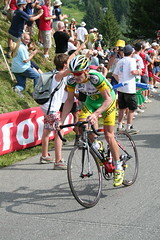 Eventually his teammate and son of 5 time Tour winner Eddy Merckx, Axel Merckx, who is NOT a climber, pulled him up the hill. He was down from the leader by EIGHT MINUTES and we’re talking about the Tour ending on Sunday. The day after, he hung with the group for about an hour. The spirits of everyone who I know rooting for him were low. And then.. he just took off. Eventually he broke away until he was all alone, hammering up the most difficult category of all the climbs. He’s now in 3rd place, down only 42 seconds from the leader. There’s a time trial tomorrow that will pretty much decide this race. DO NOT MISS IT! Everyone including 5 time Tour winner Bernard Hinault and 3 time American winner Greg Lemond have commented on what an absolutely epic performance this was. Some went so far as to say it was one of the most exciting moments in bike racing history. This Saturday will put the icing on the cake. Now while I have to respect his drive, motivation, endurance, and undoubtably perfect form, this video that Alan just emailed to me is pretty damn spectacular. Fixed gear trick riding like you’ve never seen. My jaw was on the floor at some of the things this woman was able to do without falling over. Watch it while you’re waiting until 8:30AM Eastern time when live coverage begins on the Outdoor Life Network. They’re also showing it at 12PM, 2:30PM, 5PM, 12AM and 8PM with expanded coverage. photo: l–o-o–kin thru under cc license. Hopefully you all are watching the Tour de France. I realize that Lance is not there, but it was really sort of boring watching him own the front of the pack day in and day out. With the current doping scandal forcing many of Lance’s major adversaries out of the race, the Tour, which is about half over, has featured some dramatic breakaways, exciting sprints, and an ever changing lineup of leaders. Most exciting is that even though they haven’t won their own race since 1985, a Frenchman claimed the leader’s position after the first stage in the mountains! Despite this, the day after, Lance’s old partners and fellow Americans Floyd Landis (who has been riding with an injured hip!) and Levi Leipheimer hammered up the Pyrénées with a Russian contender who ended up taking the stage. Despite an all-out effort from the Frenchman to keep his position, our very own Floyd took the yellow jersey and the lead of the Tour. The French are still 2nd, though. They’ve actually put on a pretty good show this Tour with more than a few French names popping up at the front. I’m almost beginning to wonder if this isn’t going to be a grudge match between the French and the Americans. If you haven’t been watching, you can see videos and pictures and news on the Outdoor Life Network (who, by the way, is showing the tour on TV) and the Bicycling magazine website. While we’re discussing the future of America in pro cycling, I should remind you that the Tour of Utah is coming up August 7-12. What? You never heard of it? Me either! Regardless, Stage 6 is supposedly going to be the most difficult stage in any cycling race anywhere in the world. If it goes well, especially in light of the drama of le Tour (i.e. the constant doping scandals) souring any enjoyment one can derive from it, we might have ourselves an exciting pro-level cycling race on our own soil. Want to be there? Try the essay contest to win a trip. If you’re there for the last stage, there’s also an opportunity to try the final climb yourself. Hey, if you can’t make it to L’Alpe d’Huez (which, by the way, you have to be able to pronounce to be eligible to enter the contest), at least you can do the Snowbird.